Fu Hung Hsieh remains Fu Hung Hsieh and Kung-tzu Yu remains Kung-tzu Yu. I hate espn+, really don’t want to purchase yet another streaming service for cards that should be in espn in the first place. I did watch most of the fights on YouTube right after though. Disappointed with Nelson. I thought he was doing well just staying in the outside and striking but he kept moving into the clinch where Edwards was better. I’m not saying Nelson was a lock to win the striking battle by any means, just that it was pretty clear after the 1st that he needed to switch it up but he never did. Anyone know what his corner was telling him? The video I saw didn’t have any of that info. Kind of disappointed in Reyes too. Not so much anything he did, and Volkan is a hell of a fighter, I just though he looked like a monster after the OSP fight, but not so much here. In the OSP fight his timing was pefect and he used it to pick his opponent apart. He couldn’t seem to recapture that performance here. Masvidal looked great. 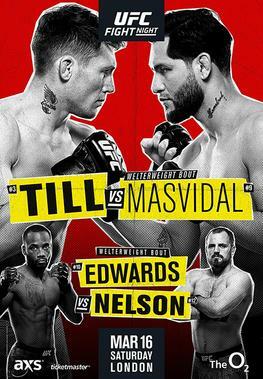 Feel bad for Till but I like both fighters so no matter how it ended was always going to leave me conflicted. Shame about the post fight brawl. Hope it doesn’t keep him out for too long. For those who missed the event. Just scroll to the next videos by selecting the next one under the video. After a foul filled first round. Masvidal gets the KO wow that was something to see. Wood gets the sub that was a nice battle. Ige gets the quick sub good for him. Grundy gets the tko good call ref Narimani was out on his feet.